Seems like a natural "evolution," right? The final week of the election is upon us, so I figured that it would be a good time to finally write something that I’ve been thinking about for quite some time. Down in Florida, Charlie Crist has been quite busy. After all, he’s had to change his party affiliation twice so he’s now been all over the political spectrum (if you think about it, his evolution looks like a reverse French flag in the sense that he went from red to white [assuming this would be the color associated with independents] to blue). Now it’s not easy being Tri-Party Crist, as one of the infamous Florida gubernatorial debates showed. He couldn’t even bring a fan onto the stage without causing a scene (my quick take on that is that Crist obviously broke the debate rules, but that Rick Scott gave himself a needless headache by making such a big deal out of it)! What better way to start the week off than having a man crush Monday (#mcm) post? There is, of course, no better way. If you listen to Charlie now, you’d think he was Obama’s biggest fan from the start, but that completely ignores that he endorsed McCain in 2008, providing him a much-needed boost in the primaries. 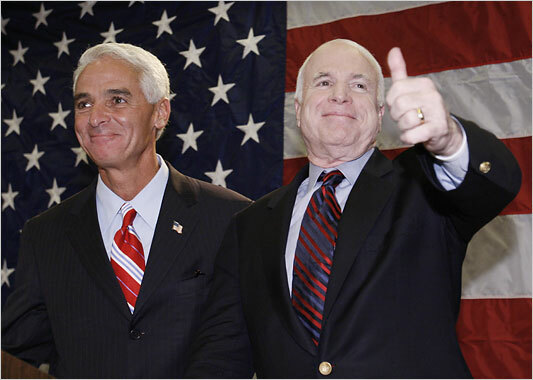 Remember when Crist endorsed McCain just 6 short years ago? Neither does he. With a week to go before Election Day, this would be a great opportunity for Crist to remind voters just how far they’ve come, right? This is, after all, transformation Tuesday (#transformationTuesday). The fact that 214,000 Democrats voted against Crist in the primary would be a great place to start, but I think that highlighting his many “evolutions” would be a great way to spend this day. This lovely article highlighting his evolution is a great summary of how today can be spent. Seems like a natural “evolution,” right? 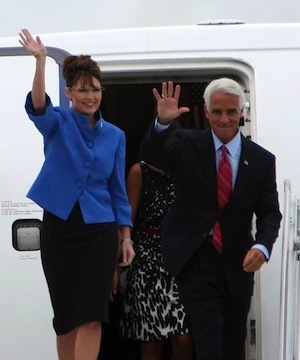 For woman crush Wednesday (#wcw), I’d highlight the praise Crist had for none other than Sarah Palin, saying she is actually the “most qualified” of any of the candidates on the 2008 tickets. For throwback Thursday (#tbt), I’d remind voters that Crist was once known as “Chain Gang Charlie” for how tough on crime he was. I think the best picture to use is one of his old campaign ads from when he was running for governor a couple of years ago. All of this adds up to a pretty busy week for Charlie. What about the weekend? I think this article from the Washington Post (of all places) that very accurately says that his excuses for leaving the Republican Party are nothing more than the expected and self serving lies he’s become such an expert at peddling. I don’t oppose people switching parties out of conviction (remember that the mighty Chales Krauthammer was once a liberal speechwriter), but when Crist tries to pretend that he can go from one end of the political spectrum to the middle to the other in less than half a decade, there’s clearly something going on. Whenever I explain this election to people, I sum it up by saying that the people who vote for Charlie on November 4th would never have voted for him just 4 years ago, and the people who vote against him on Election Day may well have been some of his biggest fans not so long ago. 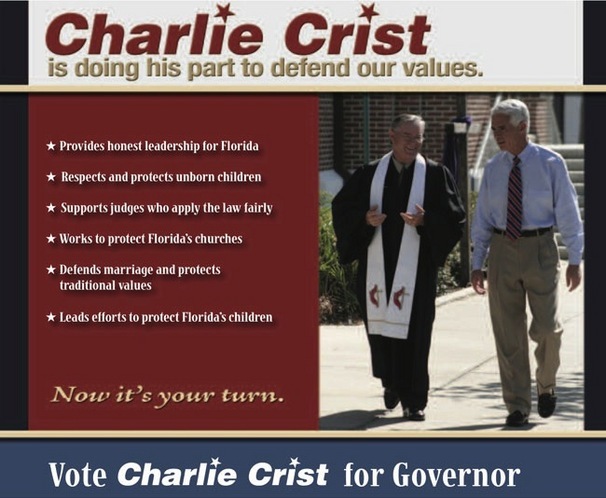 Whether he wins or loses, Charlie Crist is not a man I envy. Fangate…because Charlie Crist needs all the fans he can get!